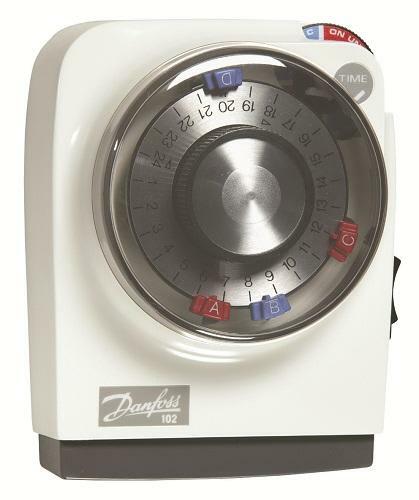 Home › Danfoss 102 FRU Complete With Dial Cover. Danfoss 102 FRU Complete With Dial Cover. The electro-mechanical 102 model is a general purpose mini-programmer which provides linked outputs for water and heating. It features a thumbwheel, which allows early selection of future switching operations. It is an easy to use 24 hour model, which fits the GP wallplate and has an identical wiring configuration. This allows systems to be upgraded without the need for rewiring. The current state of output is clearly visible on this model. The 102 is used with control systems where heating and domestic hot water are required at the same times. The heating can be switched off during the summer.